PHUKETWAN recognises the importance of Asean with the Economic Community approaching and marks what's happening around the region with a new column, Asean Today. smh.com.au The first group of refugees from the tiny Pacific island of Nauru are expected to be flown to Cambodia as early as next week as part of a controversial $40 million resettlement deal. Up to 10 people are believed to have said they will abandon their hopes of living in Australia and make the journey to impoverished Cambodia, sources say. news.com.au From Thursday it will be illegal to sell alcohol in mini marts in Indonesia, including Bali. Indonesia Institute president Ross Taylor said nationalist sentiment was also running high, with Indonesian authorities reviewing every property to ascertain whether it was being held on behalf of a foreigner. bbc.com Indonesia's government has summoned Saudi Arabia's ambassador in Jakarta to protest against the execution of an Indonesian domestic worker. Siti Zainab was beheaded on Tuesday in Medina after being convicted of stabbing and beating to death her employer, Noura al-Morobei, in 1999.
telegraph.co.uk The ball - shaped like the Earth - seems to have been created as a gimmick to tempt tourists to take holidays in Malaysia. However, due to a mis-spelling, it invites them to ''come and distress'' in the country. 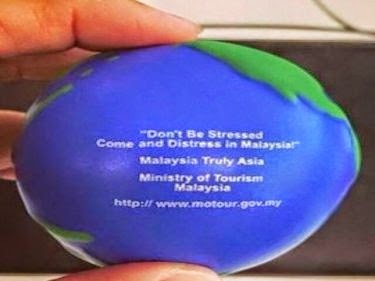 It is currently unclear as to whether the stress ball is a genuine Tourism Malaysia item. ft.com Is Malaysia falling apart? The very idea seems absurd. After all, is it not one of southeast Asia's wealthiest and most stable countries, with regular elections and a solid middle class? Scratch below the surface, and Malaysia is undergoing a slow-motion political crisis. dpa At least 20 policemen were injured with knives and acid as violence erupted during efforts to evict a family from a farm in southern Vietnam for a dike project, authorities said. wsj.com Vietnam Joint Stock Commercial Bank for Industry and Trade, better known as VietinBank, said its shareholders approved a plan to merge with the unlisted Petrolimex Group Commercial Joint Stock Bank, the latest step in Vietnam's effort to shore up its banking system. channelnewsasia.com Australian Sandy Robson is paddling her way from Germany to Australia in a kayak. She embarked on her journey four years ago and arrived at Raffles Marina Yacht Club on Wednesday. She will rest in Singapore for a few days before continuing her adventure through Indonesia and Papua New Guinea before finally arriving in Australia. alarabiya.net The Philippines Department of Tourism is currently on a visit to Saudi Arabia in a bid to attract family travelers from the kingdom, after visitors from Saudi Arabia increased 11.5 percent in 2014.
philstar.com The United States wants to deploy advanced air and naval equipment to the Philippines, which is seeking ''substantive support'' from its long-time ally amid China's massive reclamation activities in the West Philippine Sea. customstoday.com.pk Narcotics Control Board Secretary-General Permpong Chaovalit said that the Safe Mekong Operation Project had minimised and seriously controlled the movements of drug trafficking syndicates and smugglers and seen seized drugs declining. The project was jointly launched by China, Thailand, Laos and Myanmar.